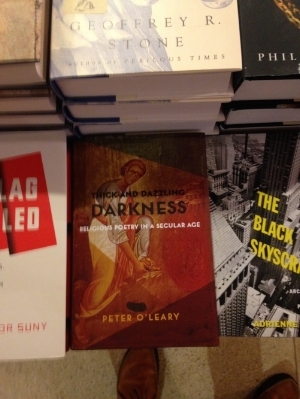 Thick and Dazzling Darkness: Religious Poetry in a Secular Age has been officially published by Columbia University Press. I am thrilled. 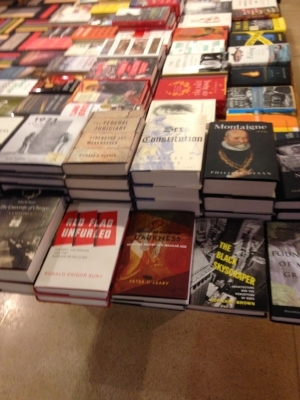 And moreso because the book is presently displayed on the legendary Front Table at the Seminary Co-op Bookstore, one of the great storehouses of intellectual power on the planet. Making the Front Table... Is there anything to compare to it? Meeting the Pope? Throwing a no-hitter? That's how I'm feeling. About a month ago, I contributed to the Seminary Co-op's terrific podcast, Open Stacks, where I had a conversation with its host Colin McDonald about the necessity of religious poetry. Thanks to Colin for the invitation. Take a listen if you're curious. Colin also asked me to make a text contribution. So I wrote an essay called "So you want to be a religious poet?" This could perhaps be used like a road map. In other news, I will be involved with a panel on the poetry of the great Nathaniel Tarn at the annual Louisville Conference on Saturday, February 24, 2018. Hidden mystagogue Joseph Donahue will be presiding. Tarn himself will be present and reading poetry the evening before, on Friday, February 23, at a reading hosted by the illuminating web journal Lute & Drum. Donahue and Tarn contemplating the void of holy logos. And because the world does not consist entirely of books, here is a photo taken in some antique land, perplexed by blue sky where boys and men stride into the tatters of the clouds. Is it the Planet of the Apes?